The village of Market Lavington is situated 7 miles south east of the thriving market town of Devizes and 13 miles south west of Marlborough. The village has a pub, church and village hall and offers village shops including butcher, hairdresser, take-aways, Co-Op, chemist, a post office and general store and newsagent. Devizes offers excellent facilities which are further enhanced by the proximity of both Salisbury 21 miles and Bath 27 miles away. There are regular fast train services to London, Paddington (75mins) from Pewsey 12 miles away and Salisbury offers services to London, Waterloo. The house is set in the heart of the village but in a very private location, and is within walking distance of the village centre. Surrounded by spectacular gardens, there are glorious views to the south to the edge of Salisbury Plain. The interior accommodation provides for excellent family living with modern requirements being catered for whilst the period feel and style has been retained. The Old House is Grade I Listed and comprises a former 14th Century Manor House, this substantial village house of rendered brick and stone construction under a pitched tiled roof is arranged over two floors. There are many period features including leaded windows, an early medieval double aisled open hall structure, the only known aisled hall in the County, exposed beams and floor boarding, panelling in the reception rooms and open fire places. Porch, Library, Drawing Room, Dining Room, WC, Study, Sitting Room, Kitchen, Utility Room, Larder. 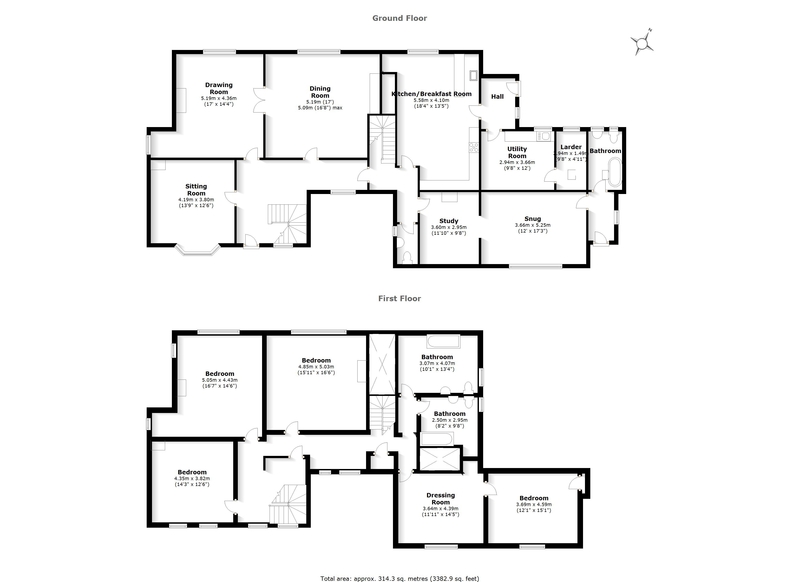 Master Bedroom with Dressing Room, adjoining Bathroom, three Double Bedrooms, Family Bathroom. Attic. The house is set privately in its own gardens with stunning southerly views over the village to Salisbury Plain beyond. There are steps from Parsonage Lane to an ornate wrought iron gate with brick and stone pillars in addition to a gravelled drive leading to the back door. A path leads round the front of the house to the Front Door. The gardens have been lovingly tended and planted to create an ornate and well stocked space with differing aspects. There are a number of mature trees ensuring privacy with, in particular, an ancient Cedar of Lebanon tree providing shade. There are lawned areas and a terrace ideal for entertaining and taking advantage of the views with gravelled paths leading to a secluded pond and fountain surrounded by arched roses, leading to a well established par-terre box garden to the north.